What About Abigail Ford, my Eighth Great-Grandmother? According to the “History of the Town of Dorchester, Massachusetts” by the Dorchester Antiquarian and Historical Society, many who immigrated to Massachusetts Bay Colony in those early years were influenced by Rev. John White, a minister of Trinity Church in Dorchester, England. He wanted form “a community in New England, where all who felt themselves aggrieved by religious or political persecution might find asylum.” Perhaps Thomas and Elizabeth felt the need, like many others, to pull away from the Church of England. On March 20, 1630, Thomas, Elizabeth and their three surviving daughters boarded the Mary and John at Plymouth, England. If Abigail was baptized close to her time of birth, she would have been about 11 years old for this voyage. Captain Squeb was in charge of the vessel, which arrived at Nantasket (present-day Hull) on May 30. Upon their arrival, a dispute arose between Captain Squeb and the passengers: Squeb wanted a “pilot” (a guiding boat) to lead the ship through the harbor to land safely. Of course, no one lived at that spot back then. Some parties left the ship to find assistance. Eventually, Governor Winthrop came from Salem to help settle the dispute. They were still in port on June 28. Many were sick, hungry and in poor health. I imagine that Abigail and her sisters probably wanted nothing more than to go home. A picture of the Mayflower and the Speedwell in their harbor. I imagine that the Mary and John was of similar build. 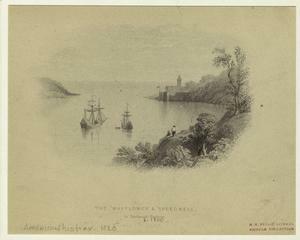 Courtesy New York Public Library Digital Collection. The settlers didn’t settle in what was to become their own Dorchester until mid-July. Food had to be sent for from Ireland, and people began fishing in Massachusetts Bay. Eventually, land was granted and families began to set up their homes. Thomas became one of Dorchester’s first Freemen in 1631. He was amongst twelve leaders who met every Monday morning to discuss the affairs of the town, a practice established at what is credited to be the first Town Meeting in the country on October 8, 1633. Perhaps Thomas told his family about some of the goings-on at the meetings over supper. So Abigail came of age as Dorchester became a community. She was still quite young when she married John Strong–perhaps around eighteen, not unusual for that time. Immediately, she was a stepmother to John’s young son and became a mother herself, as discussed here. At this time, she left the town that her family had a part in founding, but played her own role as wife and mother in other towns that John Strong helped mold and grow.